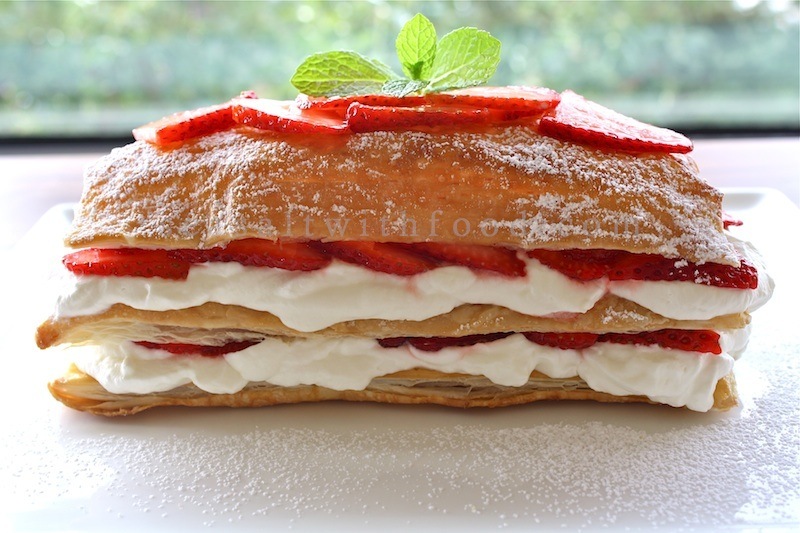 Today, I am posting an easy and yet elegant dessert recipe called Strawberry Millefeuille. It’s a traditional dessert made by layering puff pastry with fresh whipped cream and you can fill it with your favorite fruits. Making the fresh whipped cream for this dessert is so much easier if you use a portable hand mixer. Well, if you do not have one in your kitchen, the kind folks at CSN Stores have generously agreed to giveaway a $60 online store credit which you can use to purchase one from them. They have a wide selection of products on their websites, it ranges from kitchen tools, baby toys, gadgets, office desks, to even barstools! ONLY ONE LUCKY WINNER WILL BE SELECTED TO WIN THE $60 CSN STORES’ ONLINE SHOPPING CREDIT. The lucky winner will be chosen at random via Random.org generator and an announcement will be made on April 20th 2010. 1. If strawberry is not your favorite choice of fruit for the Millefeuille, then what would be your other preferred choices? 2. Follow Seasaltwithfood on Twitter and leave your Twitter name. Registration for this giveaway will commence on April 9th 2010 and will end on April 18th 2010 at 11:59 PM PST. Open to all U.S./Canada residents, 18 and older only. Well, please remember to leave your email address in your entries, or please ensure your profile is public. Good luck to all my valued readers! On a lightly floured board, roll out the pastry sheet to ¼ inch thickness. Cut in half lengthwise. Transfer the 2 rectangles to a rimmed baking sheet. Prick them evenly all over with a fork and brush with the beaten egg. Bake until the pastry is puffed and golden, about 20 minutes. Meanwhile, in a bowl, stir together the strawberries, lemon juice and sugar. Set aside. In another bowl, using a whisk, whip the cream until soft peaks form. I would love to win a hand mixer! I feel like its something everyone should have, but I somehow don't... and I dont' always feel like dirtying the kitchen aid. I'd stick with the traditional strawberries with this. Such a classic paired with cream. Although banana might be interesting too. 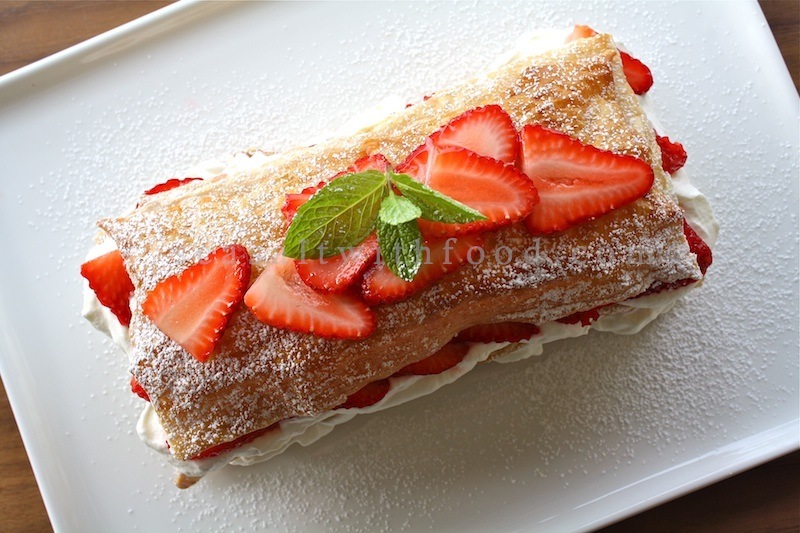 your strawberry millefeuille looks stunning!! My mouth is watering! Strawberry would be my choice! I'd love to try a raspberry millefeuille! I would definitely stick with the strawberry...looks delicious! So we have to follow you on Twitter to participate in this contest or is it an option? @Anonymous: Not necessary, you are allowed to post up to a maximum of 3 entries. I'm following you and have tweeted the giveaway as well! Love your recipes, BTW, I've been reading for a while now! Raspberry or peaches!!!! nom nom nom, yum! i think i might use mango, mangoes are coming back to season soon (enough)! I think that really ripe peaches would be delicious in this dessert! Strawberries would definitely be my first choice, but peaches would be REALLY good, too! Kiwi would be good too! Strawberry would be my favorite choice of fruit for the Millefeuille. If it's not strawberries, I will make this with mango. This dessert reminds me of something I had before in KL - strudels. They were also made with layers of puff pastry, cream and fruits. Apple strudels were great. I'd prefer blackberries or raspberries, myself. Looks lovely, nonetheless. Oh man - I would love this with strawberries, but with the addition of lemon curd. Yum!! Blueberry or raspberry. Beautiful dessert! I would also prefer strawberries. Peaches would be great choice. Raspberries or blueberries would be good. Personally, I prefer mine with just custard and no fruit. I would love to make this with kiwi! So easy and elegant ... good enuf reason to always keep some frozen puff pastry around! This not only sounds delicious it looks like a work of art! A mango millefeuille sounds mighty delicious. I think I'll try it sometimes! I would like to try this with either mango or dragonfruit. As the heat starts mountain down South, peaches would probably be my go-to! I would like strawberry on mine. It would be like a flaky strawberry shortcake!! Yours looks perfect!! The strawberry one looks delicious. Strawberries would actually be my first choice! But if I didn't have straweberries, I'd go with blueberries... yum! I would choose Strawberry. It looks amazing! Although I do enjoy strawberries, I think I might enjoy blueberries even more. I am following Seasaltwithfood on Twitter (username Nelsby). I have never had Millefeuille, but I imagine raspberry would also be yummy. Mmm... strawberry all the way! If not strawberry, perhaps blueberries? I love pineapple, maybe that would be good. I'm a new follower, i'm #500! I think it would be lovely with thinly sliced peaches! OMG this dessert looks amazing! 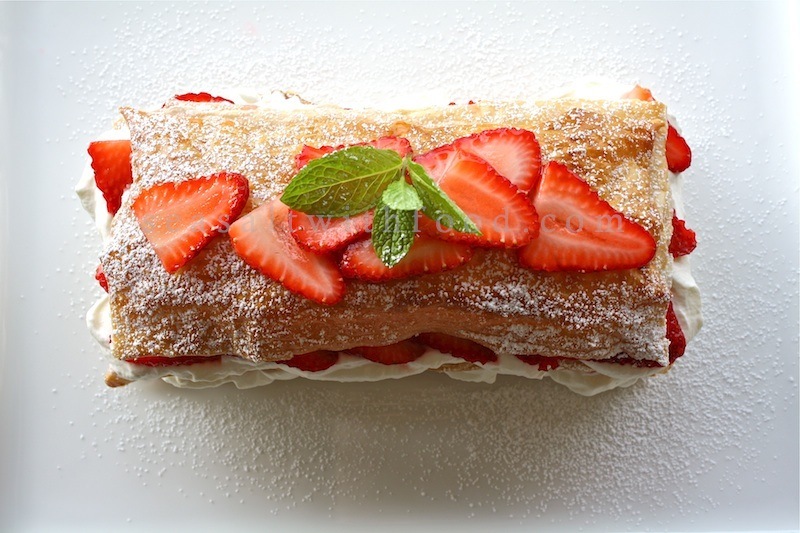 I'd like the strawberry, but a Millefeuille (I have to admit I've never heard of these until reading this post) with Lemon Curd and Raspberries sounds great to me. I love lemon desserts. My other choices would be peach and blueberry!